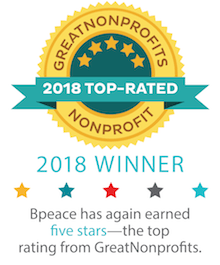 For weeks, Johnna Hobgood from Microsoft, Jonathan Liljegren from PricewaterhouseCoopers, and Phyllis Rosen, a retired Ogivly exec worked with Bpeace HQ to prepare for a trip to Afghanistan to teach workshops in marketing, pricing, and HR to the Fast Runners. After violence broke out in Mazar, normally a very peaceful town, we made some last minute adjustments and relocated the trip to Dubai. Though we were all disappointed not to be going to Afghanistan, we were warmly greeted by the Dubai Women's College which provided us with incredible resources throughout the Summit. Before the official Summit kickoff, Bpeace CEO Toni Maloney spent two productive days working with the Fast Runners who manage DOSTI soccer balls--Taj, Aziza, and Masooda, Long days were spent in Toni's hotel room discussing more efficient ways to purchase and transport raw materials, introducing balls in the European market, and new marketing materials. Once business decisions had been discussed and agreed upon, the women all tuned into the Royal wedding which sparked lively discussion about international marriage customs and why British women love fascinators. Just as DOSTI meetings wrapped up, three Bpeace trainers arrived from the U.S. and our 16 Afghan Fast Runners, along with Bpeace staff member Soraya Omar, arrived from Afghanistan. The following morning we all headed to the Dubai Women's College where we spent the morning hearing the Fast Runners update us all on business progress. Drum roll when Toni announced the first-ever Fast Runner Challenge. The Fast Runners were split into three teams, which they named Harmony Team, Yes, and Empowerment and they immediately began planning their path to victory. Over the following three days, each team attended morning workshops in marketing, pricing, and HR. The Bpeace trainers worked diligently in the preceding weeks to create workbooks in each area which were used to guide the discussions. In the afternoons, each team member attended an individual clinic with the mentor that taught their morning session and a faculty member from the Dubai Women's College. This gave each of the Fast Runners an opportunity to have an in-depth discussion about a problem they were facing and set out realistic steps for them to address it. When not in a clinic, the Fast Runners worked within their team on solving that day's challenge in marketing, pricing, or HR. On the final day of the Summit, the teams presented their solutions to a panel of judges from the Dubai Women's College. The Summit concluded with a victory by the Harmony Team. Masooma's concluding speech on the importance of implementing their newly learned business tools in Afghanistan helped the team clinch the win.